Back in June, I reviewed the Mane ‘n Tail Original Shampoo and Conditioner and I think that it would be fair to say that I had mixed thoughts on it. My hair felt dry and looked dull after use but it did feel full and strong which are effects that I like on my hair but not enough to repurchase as the bad outweighed the good. 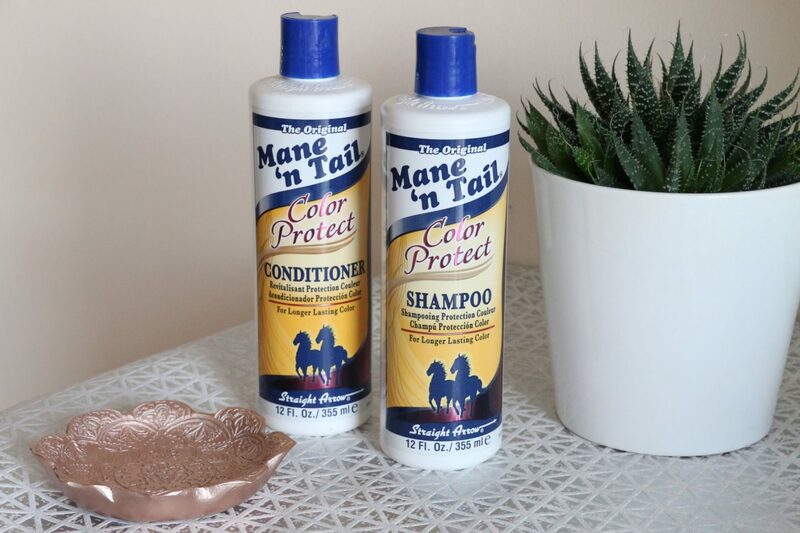 After going back to my much loved L’Oreal Pro Serie Expert range, as well as trying out some other products that I’ll review soon, I decided it was time to revisit Mane ‘n Tail; this time with the Color Protect range. In all honesty, I think that this is the range that I should have been using all along. I was a little worried about trying it given that I have a root stretch now with quite a dark colour compared to previous low lighting that I’ve had in my hair but I’m pleased to say that my colour still looked lush after using the Mane ’n Tail Color Protect Shampoo (also available here) and the Mane ’n Tail Color Protect Conditioner (also available here) and I do think that they did a great job at protecting and maintaining my hair colour. The shampoo contains micro-enriched proteins to strengthen and condition the hair while adding body and shine. It feels as though it thoroughly cleans the hair but gently so as not to strip it or leave it feeling too dry and squeaky clean. It is silicone free and doesn’t contain some of the harsh chemicals that you can find in shampoos from other brands. The conditioner also has proteins within the formula and feels as though it is more nourishing on the hair than the shampoo is which in fairness, it should be. I don’t think that I could use the shampoo alone as it does still leave my hair a little dry after use although not as much as the original formula, so following up with the conditioner is a must. I find that it has a great detangling effect on the hair and it helps to keep the knots and tangles at bay while ensuring my hair feels strong. I feel as though my hair has a healthy sheen to it after I’ve used the conditioner but it doesn’t weigh my hair down or make it feel greasy, which is ideal for me as I want my fine blonde hair to have a shine to it but my oily roots don’t need any more encouragement! Out of the two formulas that I’ve tried from Mane ‘n Tail, the Color Protect Shampoo and Conditioner is definitely the duo I’d suggest trying out of the two. If you have really dry hair already then I’d skip them but if its fine and prone to breakage, regardless of whether its coloured or not, then they could work well for you within your routine. Perhaps using them every other wash as a way to maintain the colour of your hair and its strength. Which Mane ‘n Tail products have you tried? What shampoo and conditioner do you use? Have you had any issues with breakage or needed colour protection?